Airsal have taken the “70” sports cylinder kit and have come up with this “77”cc racing kit. 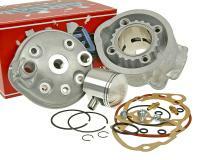 Includes all parts for installation: gasket set, piston, piston rings etc. Cast aluminium for improved heat dissipation with a hard chromed bore for wear resistance. Smooth torque and great performance make this cylinder great value for money. No additional work to the AM engine crankcases is required and the original head is retained. Amazing quality no burrs or defects and as always insanely fast delivery. Check squish band with this kit with thick solder and digital caliper.